DBConvert Product Line is one of our priority-driven projects focused on data transferring between different Database Management Platforms. It includes a number of powerful converters and synchronizers that perform accurate and convenient way of data migration from one server to another. The intuitive functionality and easy-to-use graphical user interface present an excellent concept of quick and efficient data entry. DBConvert tools handle the process of transformation and replication data between the most of known database engines such as MS Access, MS SQL, MS FoxPro, MySQL, PostgreSQL and others. We constantly improve existing and seek new solutions for adding new products in DBConvert product line. 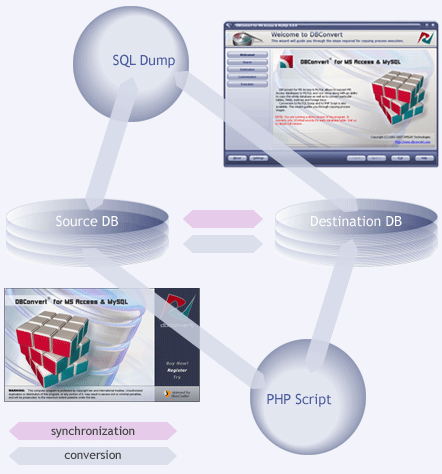 If you are database manager or administrator, even if you are expert in database development DBConvert tools can simplify your daily work with data processing. The main idea of converter using is the distinguishing any details in database structure, among data types and relations between database elements in source and target. Duplicating data DBConvert tools establish stable connections between platforms and provide secure tunnel for safe data running with SSH settings if needed. You are allowed to create Dumps and PHP scripts for data uploading on MySQL, PostgreSQL and MS SQL thereby going a roundabout way to possible server restrictions. Generate prg files if you work with MS FoxPro. Get a full control by configuring integrated data filters which allow users to retrieve only specific data for converted tables according to defined filtering criteria. DBForms series includes special innovative tools turning your MS Access forms to web pages written in PHP code and available for viewing through Internet browser. MS Access tables in their turn are converted to MySQL or PostgreSQL database which connects to adjusted PHP module. DBForms from MS Access to ASP.Net + MS SQL converts mdb file (Microsoft Access database) to ASP.Net web-pages with MS SQL back end. Our unique tool easily transforms Access forms and their parts to .aspx pages. During conversion elements position, color pallet and fields types are saved.